A Wedding Cake is not just another item that can be chosen without a thought. Such a special day requires a unique cake which meets your wishes and personality. Maybe you already know exactly what your dreamcake looks like. Or perhaps you are starting to think about it. Or you might need some more inspiration. No matter how, we at Tartacadabra are at your disposal to create a wedding cake that neither you nor your guests will easily forget. If you still don't know what theme or style suits you, we can arrange a tasting consultation where you can try a couple of flavour combinations, and we can look at all the possiblities of the decoration. Inspiration for the design can be drawn from many sources: invitation cards, the bride's dress, the season, favourite colours, brands, designs, favourite flowers, etc. Of course we have many publications about wedding cakes at your disposal, with hundreds of examples, from truly classical to absolutely modern. Afterwards we will offer you a preliminary sketch including every aspect you wish. We will work together on the sketch until we get a definitive design for your unique cake. Depending on this design we will calculate the final price. The price for the degustation is € 30. If you finally decide to order your wedding cake at Tartacadabra, this sum will be deducted from the final price. Our wedding cakes have a starting price of € 6,50 per serving, depending on detail work and design. 50% of the final price must be paid at the moment of placing the definitive order. The rest must be paid at least two weeks before the wedding date. 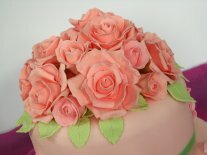 We will deliver our wedding cakes to the chosen location if it is for at least 50 guests. The delivery costs amount to 25 eurocents/km. Smaller cakes can be picked up at our location, since they are easier to transport and store. We are confident that your wedding cake will give your happiest day a magical touch! We wish you all the best for the life you are beginning together.